Stevie and I are super excited (and, admittedly, a bit overwhelmed) about this next season of life, and we canâ€™t wait to welcome this little babe into our family that weâ€™ve already fallen so in love with. Weâ€™re due August 17th, so Iâ€™m about 17 weeks along in this pregnancy journey. Itâ€™s been a wild ride, so here are the details so far, as well as what you can expect from me in the months to come. Unbeknownst to me, I enjoyed my last glass(es) of wine at my birthday dinner on December 10th. (It was a great bottle too, friends. I went out the next day and bought three more. Guess thoseâ€™ll turn into hostess gifts!) 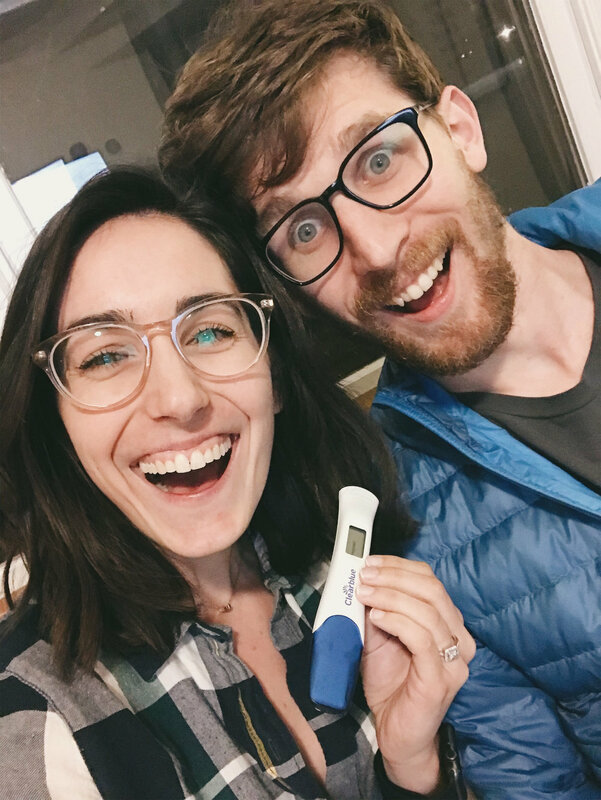 When December 13th rolled around and I still hadnâ€™t started my cycle, Stevie suggested I take a pregnancy test when he got home from work that day. One of my strongest memories from that day was that I was cravinggg a spicy tuna roll, but I resisted the urge to run out and grab one for lunch and figured Iâ€™d treat myself the next day if the pregnancy test was negative. Sitting on the news for about 10 days was surreal; it was our little secret and hardly felt real. We confirmed the pregnancy a few days later with my OB/GYN, and decided to reveal the news to our families as a Christmas present since the holidays were upon us! We didnâ€™t have any ultrasound photos to share by the time we told our families, so we decided to wrap a letter board for each of them as a Christmas present. We prefaced the gift by saying their â€œrealâ€� gift would be coming a little late, so this was a placeholder while their real present was on the way. They unwrapped a letter board that said â€œGIFT ARRIVING AUGUST 2019.â€� This is the first grandchild on both sides, so the news was received with so much joy and excitementâ€”and lots of tears from both of our moms. I had been feeling pretty good until Christmas day, when I woke up with some general nausea. Stevie and I had planned a ski trip with some of our best friends from college in Whistler, Canada, and left super early on December 26th. He had sweetly packed me a big bag of saltine crackers for our long day of travelâ€”which I promptly threw up into during the entire Uber ride to the airport. Yâ€™all, this was my worst day in recent memory. I was so nauseous, I couldnâ€™t keep anything down and felt like I could hardly walk, and we had a 12 hour, international travel day ahead of us. After our 5:30 am Uber ride, we had a 3 hour flight to Toronto, then a 5+ hour flight to Vancouver. Due to some weird glitch in the system, Stevie and I didnâ€™t have seats next to each other on the longer flight, and the people next to both of us were families that, understandably, didnâ€™t want to switch seats. So, there I was all alone for 5 and a half hours just trying to keep some fluids down and not die of nauseousness before we landed in Canada. And once we reached Canada the fun wasnâ€™t over: Rory and Kerry picked us up in the mini van rental and we had a 2.5 hour drive up the windy mountain roads to Whistler Village. By the time we reached our cabin, I christened it with my pregnancy glow threw up profusely. Apparently pregnancy symptoms and extreme altitude changes donâ€™t mix. I knew I wouldnâ€™t be able to ski anyway once I found out I was pregnant, but I figured Iâ€™d spend my time exploring the village, maybe making a Whistler travel guide, and doing some lighter activities like snowmobiling or snowshoeing. I spent most of the week laying down on the sofa with a trashcan close by and Netflix streaming in the background. Iâ€™d sip on ginger tea and try to convince myself to eat when I could. The normally-glorious smell of a pine cabin was almost revolting as my sense of smell was going whack, so Iâ€™d sit there like a crazy person sniffing lemon slices to combat my strange aversions. Long story short, Whistler was by far my worst week of symptoms. Weeks 8-11 were pretty rough overall, though. I came into January thinking Iâ€™d be so productive and on the ball, and honestly I spent a lot of it draped over the toilet. I know everyoneâ€™s experience is different, but I certainly felt like my body was being hijacked and there was nothing I could do about it. Amid all of this (at about 9 weeks) I started yoga teacher training. I didnâ€™t feel great most days, but it has taught me the valuable lesson of just being on my mat today, taking what I need and giving what I can. As someone who always opted for the â€œadvancedâ€� variations throughout class, itâ€™s been a humbling and enriching experience to look at yoga not as whoâ€™s doing the hardest pose in the room, but instead asking myself: â€œAm I giving myself what I need today, regardless of whatâ€™s happening around me?â€� That extends far beyond the reach of my mat, and that one mental shift has been so life giving. My last â€œincidentâ€� was on February 7th, so Iâ€™ve gone about a month without feeling debilitatingly dependent on the proximity of a bathroom. Praise hands! And with that newfound freedom I feel like a totally new person. Itâ€™s great to have the first trimester behind me, where my only real worry is how much longer Iâ€™ll be able to button my jeans. Iâ€™ll take it, folks. Iâ€™ll take it. Oh boy, itâ€™s been hard to turn down so many inquiries for the Fall season, but Iâ€™m committed to taking a maternity leave and spending a few months diving headfirst into my new role and learning the ins and outs of what motherhood is all about. With that, Iâ€™ll be doing minimal shooting in July (8 months pregnant. In July. In Georgiaâ€¦can you blame me?) and taking August, September and October off almost completelyâ€”aside from a couple of commitments Iâ€™ve made that I just canâ€™t bear to pass on to someone else. November and December will remain pretty low key with just portrait and holiday sessions. Itâ€™s scary to turn work down, but I know itâ€™s the right call for our family. And Iâ€™m excited to soak in this next season without the added burden of trying to be on my feet for 10-hour wedding days. Iâ€™m just going to be trying to keep a little life alive and learn what itâ€™s like to change a diaper when Iâ€™m half asleep, you know? My goal is to keep blog content cominâ€™ atcha by creating and scheduling it in advance, so hopefully it wonâ€™t be radio silence around here! What do I need to know? Any mama birds out there with advice on what I definitely need to register for? A book that particularly helped you prepare? Heck, ways to stay comfortable(ish) along the way? Let me know in the comments!